The folk-rock group of the mid 1960s to the early 70s, the Byrds, came out with a stream of hit tunes. Probably, the most famous being, Turn, Turn, Turn from 1967. This song was a reflection of the times when protests over the Vietnam War were rampant across our country. The melody and vocals of this hit song are unforgettable once you start to hum it, and the words cemented this song in rock & roll history. Taken from a book of the Bible, Ecclesiastes (Greek for Preacher or Teacher), the words and wisdom of King Solomon force us to examine time and events, and their effect upon man. Although not written verbatim, but pretty close, the only major change comes in the last stanza where the lyricist replaces, “…a time for war, and a time for peace…” with ” a time for peace, I swear it’s not too late”. The verse which best fits this time of year, the changing of seasons from Summer to Fall, is actually found in all of the verses because the dynamic revealed in each stanza is occurring somewhere in the world at this very moment. 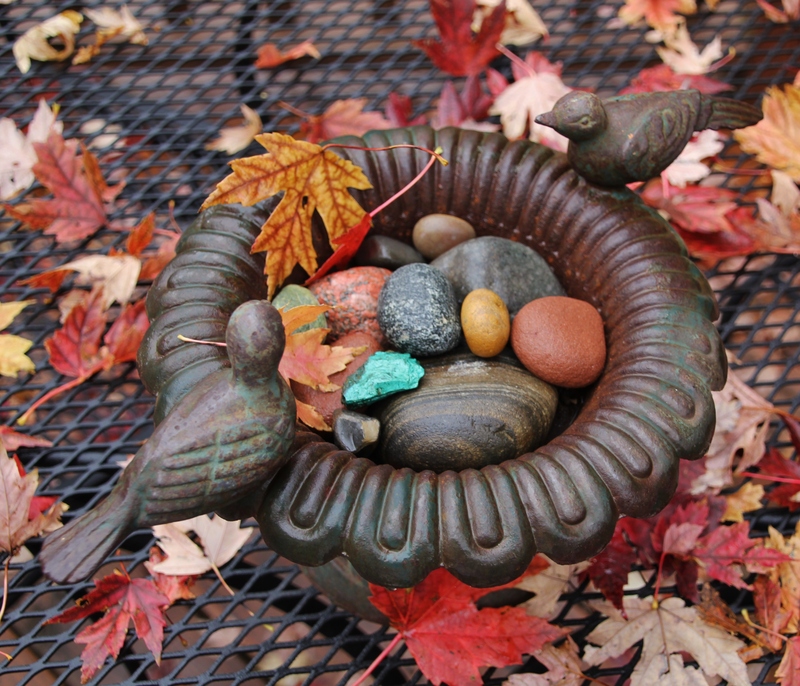 The cast iron planter above reflects several of the symbols found in the words of this section of scripture and song. Autumn can be so beautiful and the earth so generous. Thanks be to God ! The expression, “He (she, I) won’t go down without a fight”, refers to someone who refuses to quit under duress. The term can be applied in many ways to fight: by physical defense or assault, by using one’s wits, by the intellect (sound reasoning), through the legal system, by political posturing and use of power or by sheer willpower. Most often we tend to admire the one who fights for what he believes to be right and true, and even on occasion we may respect someone’s tenacity even if we disagree with him. Do you ever think about yourself in this way? Have you had reason to stand your ground and fight lately? Ever? Regardless of the outcome, how did this stand make you feel: good about yourself or poorly? If you won, did you gloat or humbly move on? If you lost did you crawl under a rug or stand tall again? At some point, and often at many junctures in life, we will have to choose to fight, run away or surrender. If the issue is just and you are called on to take a stand and fight for what is right, I hope you fight. That statement reminds me of Lee Ann Womack’s lyrics where she sings, “And when you get the choice to sit it out or dance, I hope you dance”. I have reacted to fights in all three ways. Of course, I prefer to recall the fight the just cause and win scenarios best. However, I have learned from my failures…maybe even more so then the victories. 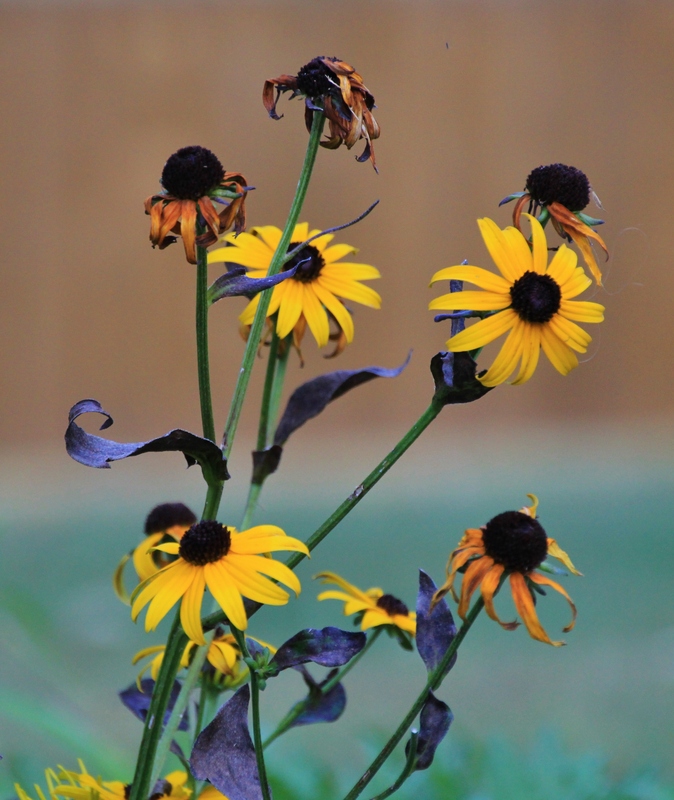 These Black-eyed Susans are fighting to bloom until the first frost stifles them. Sure, some have surrendered to the fading sun and cooler temps, but several are still hanging on. They want to share their essence for as long as they possibly can. That is how I want to live the rest of my life. You, too? 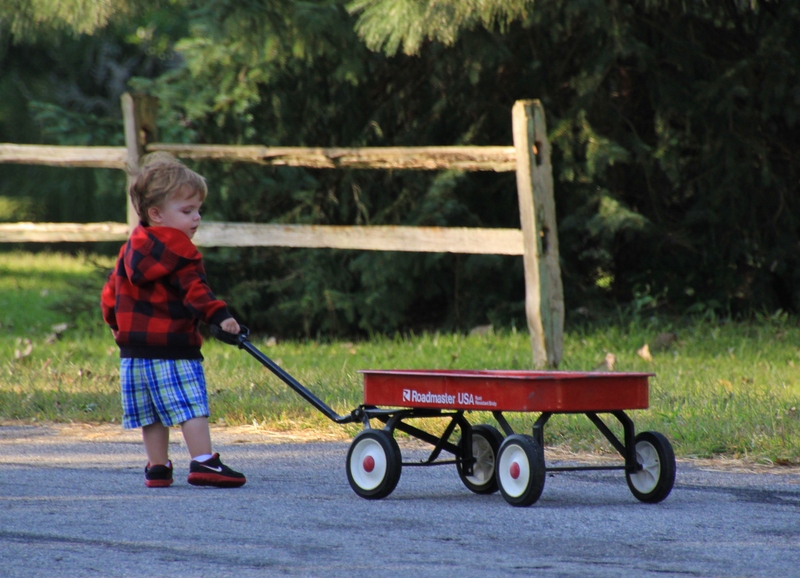 It is difficult to believe how quickly two years have gone by since Elliot was born…October 16th. 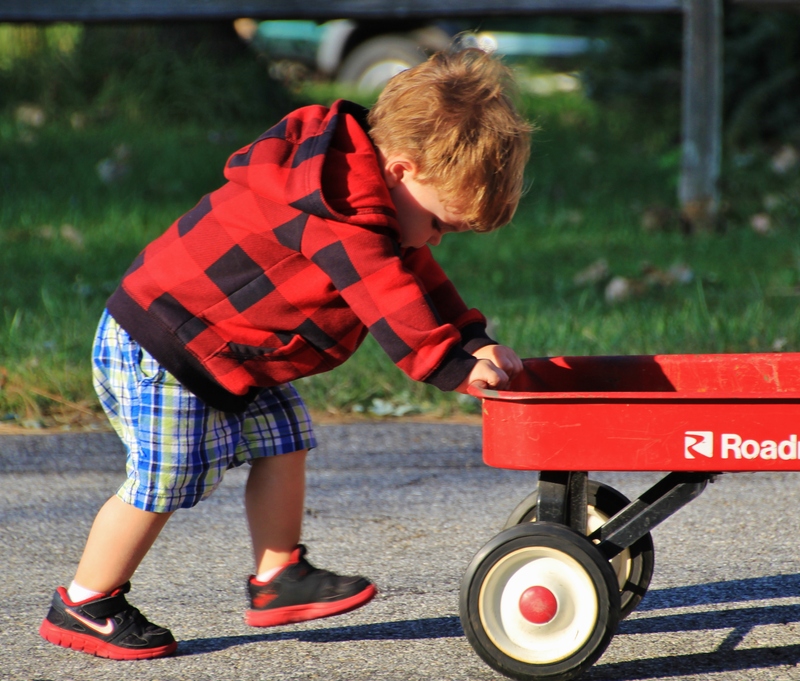 With each passing week he increases his vocabulary, his skills, his appetite, and his independence! Now that he has a baby sister, Elliot will go through the tough days of letting go of things which he thinks are strictly his. I think little Audrie will have a wonderful big brother, once he shares his grandparents with her. Haha!! 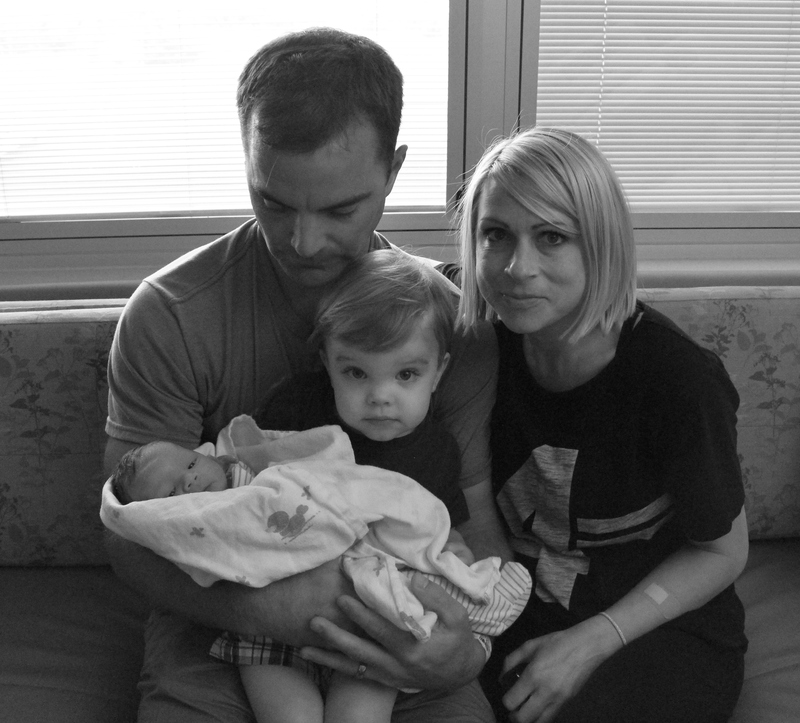 Matt, Ramie, Elliot & Audrie, September 17, two days after Audrie’s birth. Both titles are from songs. The first by Bob Seger & The Silver Bullet Band and the second by Jethro Tull. However, this post isn’t about songs, but night trains and a special photographer by the name of O. Winston Link. The titles simply fit the subject rather well, and the songs were fun to listen to back in the 1970s. 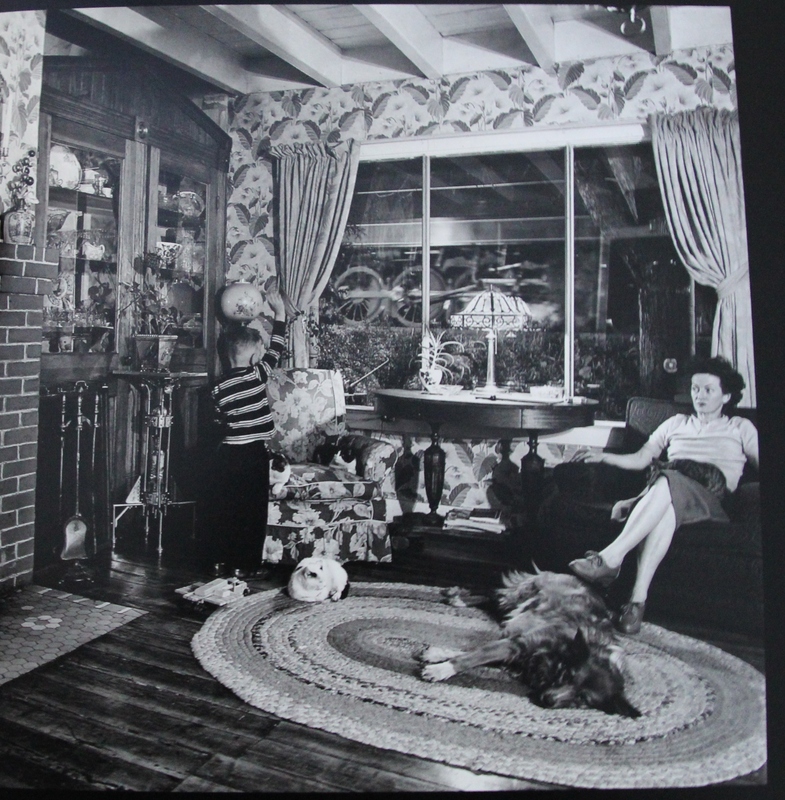 This a lengthy post due to the explanations and sampling of Winston’s photographs. I have never shot glossy photos and shared them on the web so I tried various methods to keep off glare and shadows, and at the same time reveal as closely as possible the accuracy of the chosen photos. I sincerely hope I have done Mr. Link a justice by sharing his unique photography techniques and expertise. I recently came across Link’s book, Steam, Steel & Stars (published in 1987) at a garage sale! The excellent descriptive text is by Tim Hensley. It is a treasure. 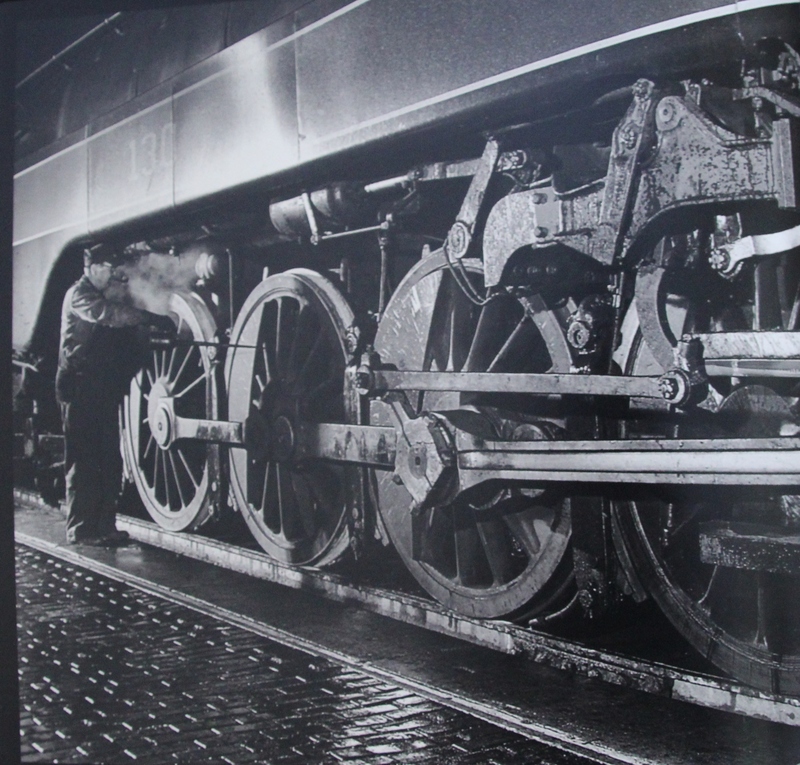 If you like trains, especially steam-driven trains and anything related to railroads then this book is sure to please. 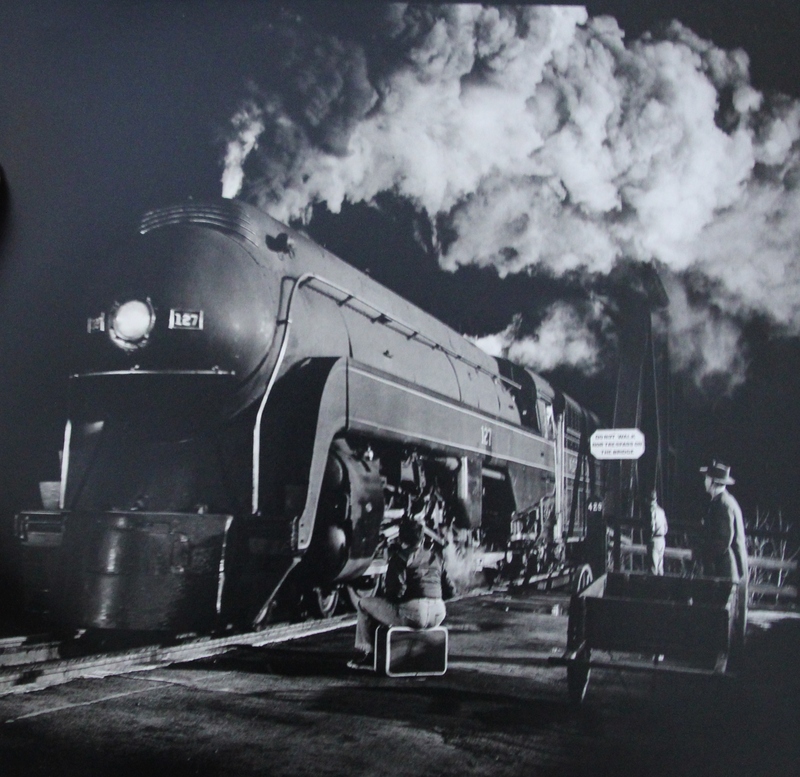 Link was a successful commercial photographer in New York and loved steam-driven trains so much that he created a five-year project of shooting the Norfolk & Western Railroad in various settings-all at night in the late 50s and early 60s. 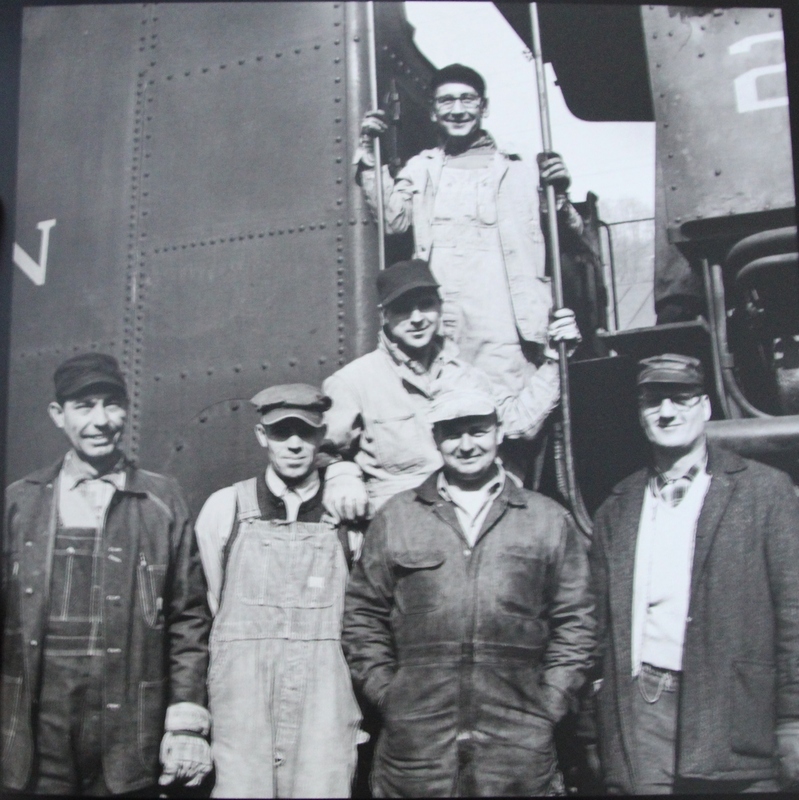 During the 1950s and 60s, the N&W was the last remaining Class 1 railroad in the United States to utilize all steam-powered locomotives. 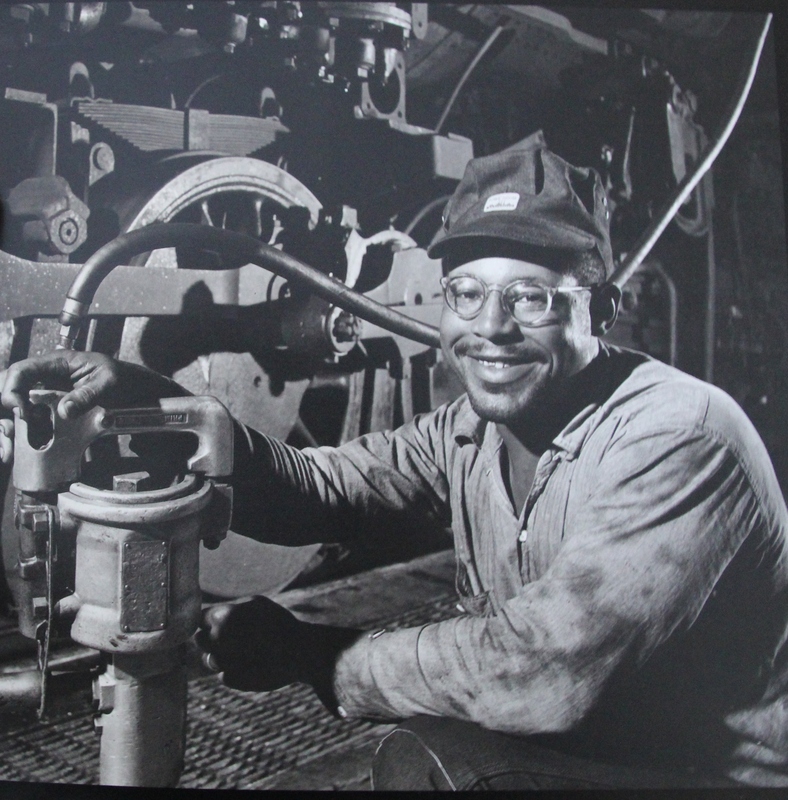 Diesel-powered units were already becoming standard on most lines. 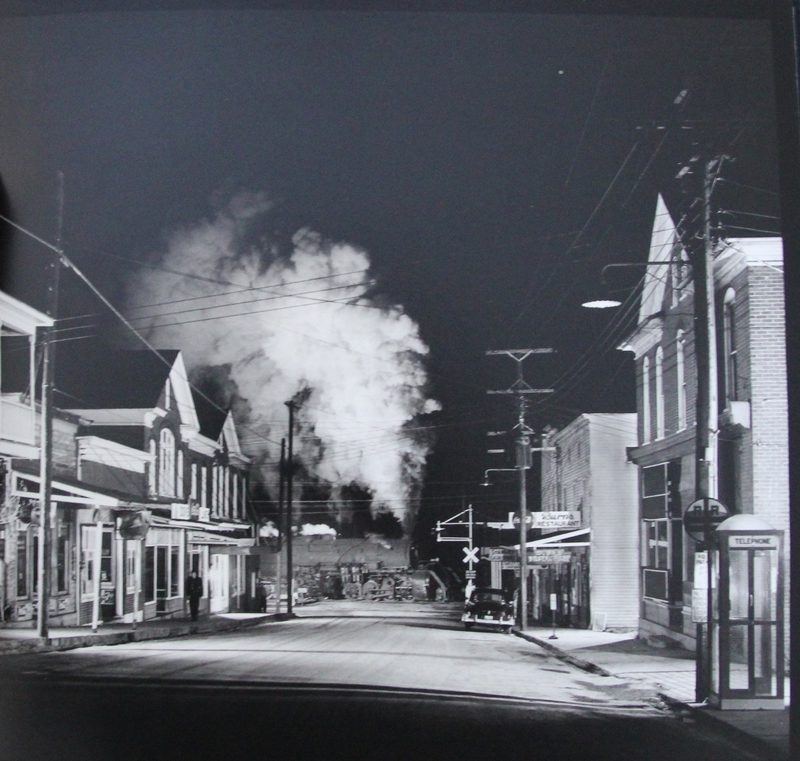 Winston’s photographs not only capture the steam engines in many unique and well thought-out locations, but also give us a time freeze of Americana during this period. 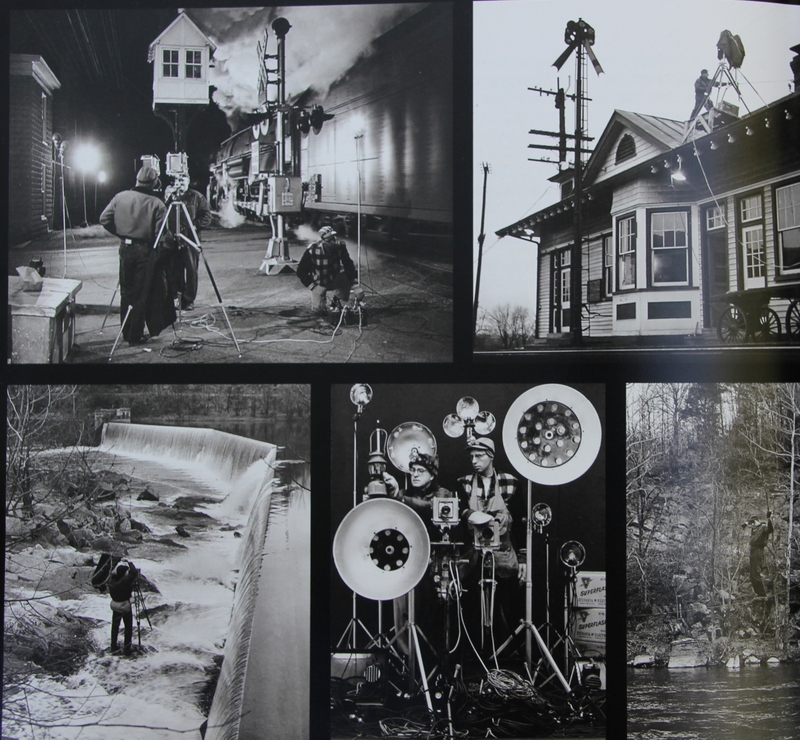 The book contains 90 duo-tone images. I have narrowed my selection to 9 plus a bonus shot. Winston Link would go to great extremes to capture his scenes which remind me of moving Norman Rockwell paintings. He would spend weeks scouting out the exact location for his camera and series of flash spot lights-all the while maintaining his regular career. He traveled extensively throughout the N&W’s area of operation; parts of Virginia, North Carolina, West Virginia, and Maryland. Below is the bonus shot which shows some of the challenges and means to capture these bellowing behemoths. His spot lights fired in unison were a unique invention and the master control was never out of his sight. Some shots required thousands of feet of cables running across streets, rivers, and on buildings. 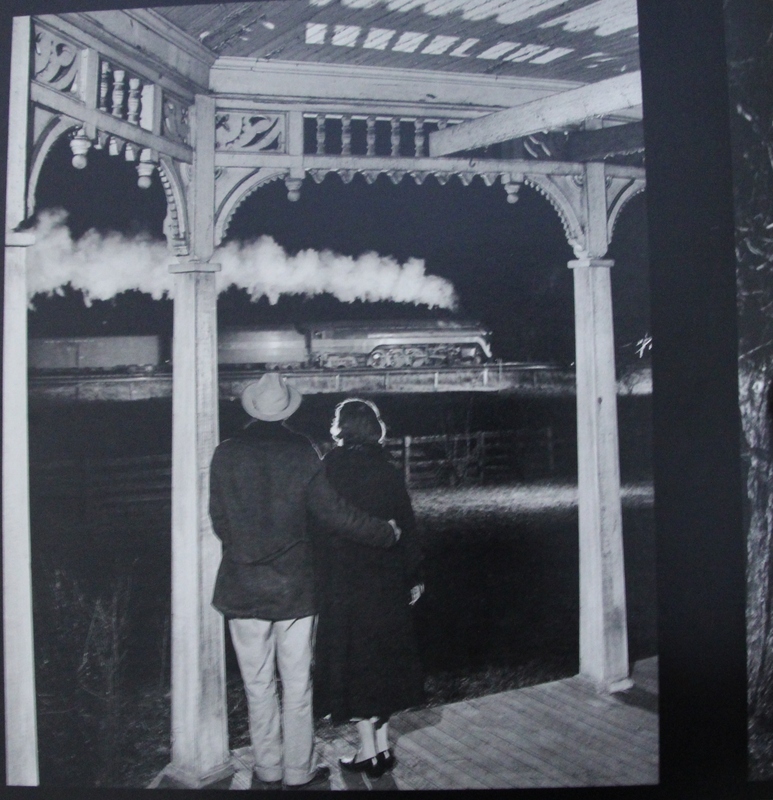 Passion would be a word to describe O. Winston Link’s love affair with steam-powered trains. 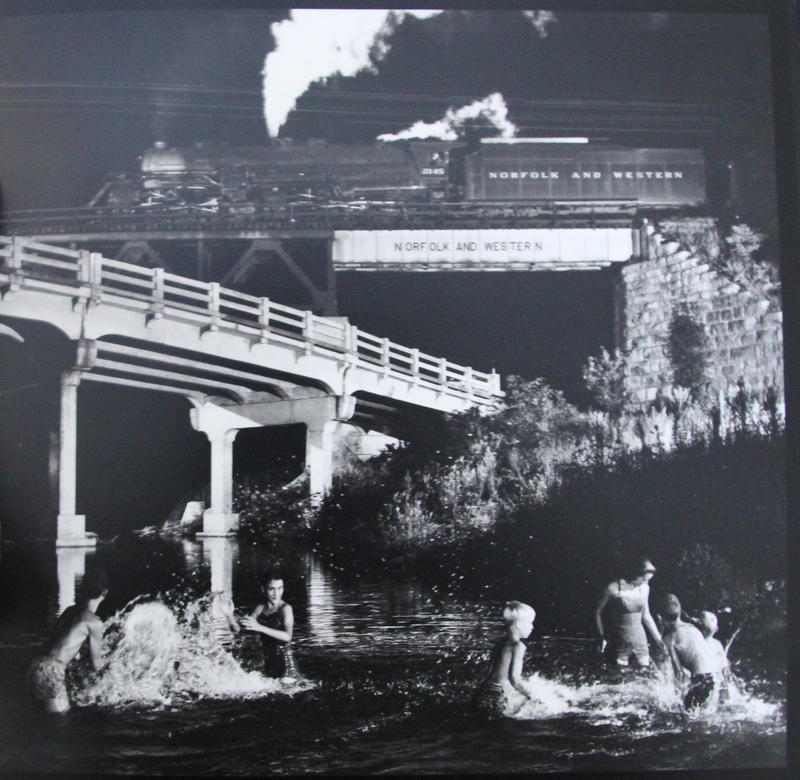 He composed great images which not only show cased his beloved trains, but tell a story about rural life in America fifty-plus years ago. 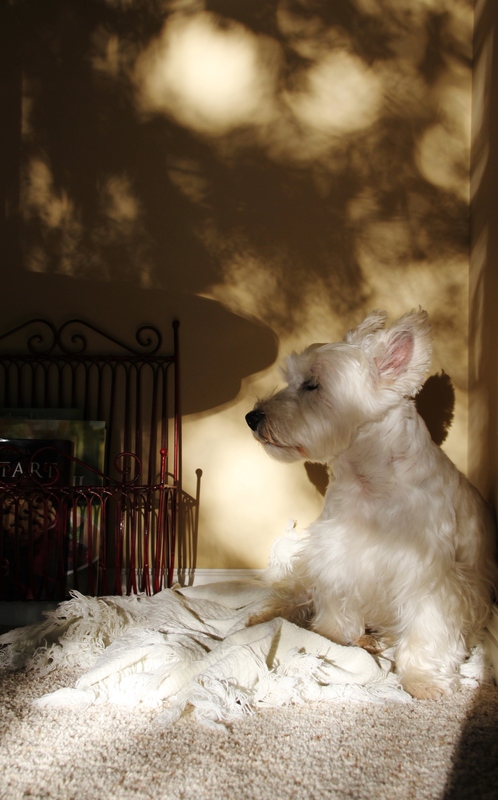 Winston can be seen on the left of the spot light photo, next to an assistant. 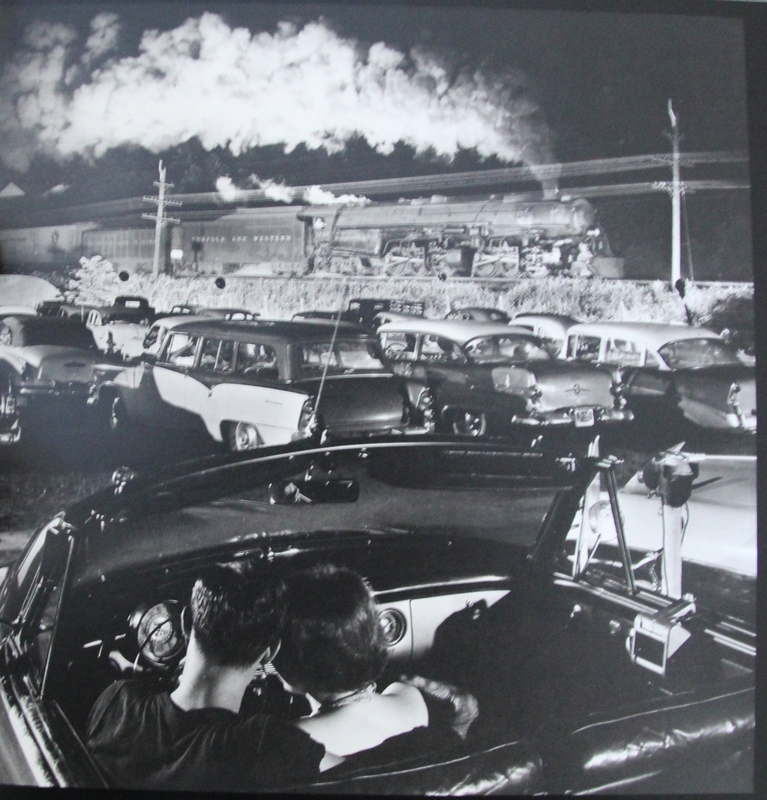 After hours of setting up, there would often be hours of waiting for a train to rumble by. Link’s work has been exhibited in prominent art museums in America, England, France and in many private exhibits. In my humble opinion, O. Winston Link was a true artist, and a clever one at that. Interestingly, his book was printed in Italy. Thanks for taking the time to view this post. I hope you enjoyed it and will look further into Link’s photography.